There are more than 70 memorials in Switzerland from the First World War. Sometimes the same memorials also commemorate deaths in either the 1870-1871 Franco-Prussian War, and/or the Second World War. Perhaps the most obvious category of memorials is those to Swiss soldiers who died during the war while serving with the national armed forces. Well, the existence of such memorials is still quite surprising, as the Swiss army was not engaged in any fighting! In fact, 3,065 Swiss soldiers died in the First World War, of which nearly two-thirds died from Spanish Flu (Influenza) in 1918. However some did die directly as a result of their Swiss military duties. The monument below was erected at Zurich in 1916, while the war was still in progress, and commemorates four Swiss army aviators who had died in separate crashes since the mobilisation of the army in 1914. In the early days of aviation, fatal crashes were sadly not unusual. The following memorial, the Kavalleriedenkmal (cavalry monument) at Lueg, commemorates 20 men from the canton of Berne who died from Influenza. The fact that they died while doing military service was obviously considered significant enough for them to merit a memorial. The next, at ​Châtel-Saint-Denis, marks the death of 40 soldiers who died from Influenza while based in Berne in November 1918. They were guarding the city as a precaution against the General Strike. In some quarters, such memorials may have been intended (consciously or subconsciously) to promote Swiss national unity in the face of social unrest such as this strike which took place around the time of the war's end. ​The next memorial shown was put up at Les Rangiers in the Jura, near the border with France, on the tenth anniversary of the start of the First World War, in 1924. It shows a Swiss soldier guarding the frontier, in a pose typical of wartime imagery, and it was paid for by a national subscription. The memorial was conceived of as a national monument to the army's wartime mobilisation, and during the Second World War the Swiss army's commander, General Henri Guisan, came to make a speech at this symbolic site. However by the 1960s, in the eyes of those who sought the independence of the Jura from the canton of Berne, the statue had come to represent their opponents. In 1984 and again in 1989, the statue was toppled by members of the independence, and while in storage it was destroyed. Although memorials are often meant to unite people in a common way of remembering, in this case this memorial came to exacerbate existing divisions. Quite a different type of memorial, which in fact commemorates military service but not deaths, can be found in various sites around the country. 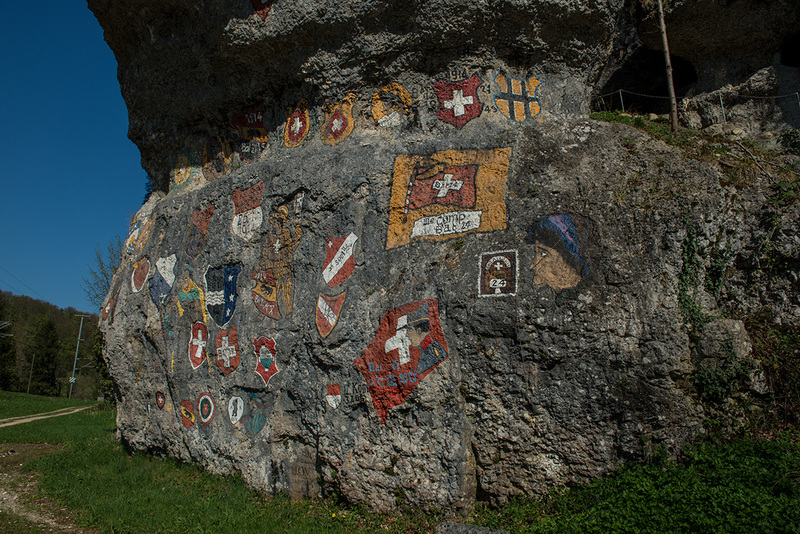 In a number of places, soldiers carved the badges of military units into the rock at locations where they were based in wartime. The most famous of these is at Chessiloch (see image). Now we turn to a different kind of memorial. That at Col des Roches (Le Locle) was built by in 1923 within Switzerland but only metres away from the French border. It was created by the Société Française du Locle (French Society of Le Locle), and marks the deaths of Swiss volunteer from that area, and also of French soldiers, all of whom are described as having "died for France". In fact, across the whole of Switzerland a significant number of people met this fate. Over 11,000 Swiss men served in the French army during the conflict, many of them in the French Foreign Legion, and over 2,000 of them were killed (source). This and similar memorials would have been a focus of remembrance not just for the loved ones of those Swiss who had died in battle in this way, but also for their surviving comrades who sought to remember their experiences. Below is a memorial created at La Chaux-de-Fonds in memory of 70 men from the town who had died while serving as Allied soldiers (seen here in October 1918). Another significant category of memorials in Switzerland is those marking the deaths of internees from some of the warring states. The "Monument to Internees" at Clarens in the Montreux area commemorates French and Belgian internees in particular. It was designed by a French officer and a Belgian soldier - an architect and a sculptor respectively - who were interned in the Montreux area. The sculpture depicts a dying French soldier who grasps his national flag with his last energies. In this case, the memorial is purely about foreigners interned in Switzerland, and does not commemorate Swiss citizens. Memorials in other locations mark the deaths of internees from the Central Powers. At the end of the war, an event took place at Chateleine cemetery in Geneva (shown in next image) that was attended by 10,000 people. It marked the deaths of Frenchmen interned in Switzerland during the Franco-Prussian War, but also commemorated internees and others who had died during the First World War. The fact that so many Swiss turned out to such an event illustrates how significantly the war had impacted on them. This was not the first such event of the war. ​The photograph below shows a ceremony on 14 July 1917 (Bastille Day) in Geneva, at the monument to French soldiers interned in Switzerland at the time of the Franco-Prussian War. Sources include: Sébastien Farré, "Commemorer les morts de la premiere guerre mondiale en terre de paix", in Christophe Vuilleumier (ed. ), La Suisse et la Guerre de 1914-1918, pp.495-512. The fact itself, but also the high number of memorials for non Swiss on Swiss territory is, I believe, quite unique in international comparison. See also my article En témoignage. Denkmäler zum Ersten Weltkrieg im Kanton Zürich, in: Kriegs- und Krisenzeit. Zürich während des ersten Weltkriegs, ed. Erika Hebeisen, Peter Niederhäuser, Regula Schmid, Zürich 2014, 223-236. Very interesting point, thank you. I have seen that book on the internet but sadly I do not speak German (I can get by in French) so I have not bought it, but it looks good.